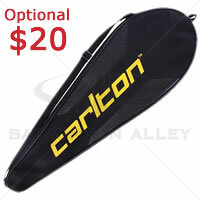 The Carlton AirLite Strike Badminton Racket is a lightweight frame (84 grams) offering exceptional power and control. The racket will suit players looking for an all round racket that offers a good blend of power and control. The Carlton Air Lite Strike badminton racket is evenly balanced and great for both offensive and defensive minded players. The isometric head shape results in excellent accuracy even on off-center hits, whereas the Japanese HM Carbon provides fantastic frame response and stability. The AirLite Strike incorporates the Xtreme Tension frame to ensure that the racket frame can accommodate 11% higher string tensions compared to conventional frames. In addition, the Pro V12 grommets allow for greater string movement and deliver increased power across the hitting zone.